We spent a couple of days on Khao San Rd in Bangkok, enjoying phad thai, banana pancakes, fruit shakes, Thai massage and all the other backpacker staples. We then up with my aunt Patti, who will be travelling with us for the next month. sounds add to the chaos because the Vietnamese love their horns and scooters will honk their horns incensantly. Heaven forbid that they might actually have to stop or put a foot down for a pedestrian! saw the convergence of these two worlds. Traditionally, they have named streets after what is sold on that particular street and so you have a Towel Street, Blacksmith Street, Spice Street, etc. We had fun walking through the Spice Street and seeing dried seahorses, starfish, geckos, bottled snakes amongst the other more mundane spices. We met up with Brian & Sara, some friends from Toronto that are living in Hanoi for the summer. We went out for our first Vietnamese dinner and followed it up with a drink at the local bai hoi joint. These places are all over and are where the local men (never usually women) go to drink cheap homebrew beer. Paul even indulged in the local snack – dried squid with chillies. Only sour point was getting charged double what we were supposed to. More about the scamming we experienced later! history of the country. We then went to the Water Puppet Theatre to see a show. The water puppet shows were invented by rice farmers during the wet season in the 11th century. The puppeters are behind a screen standing in the water manipulating the puppets. Music is an important part of the water puppet show and there are a group of musicians playing traditional instruments. The scenes depict traditional legends and stories about daily life. They are quite funny and the puppets and music were beautiful. They have even gotten into the 21st century, by adding pyrotechnics. Hanoi is apparently the best place to see a show as it was invented here in the north. Halong Bay is a popular local tourist destination. We thought we were escaping the chaos of Hanoi, for the tranquility of Halong Bay, but we were mistaken. Even the boats love their horns! The wharf was total craziness as the boats playing bumper boats as they jockeyed for positioning. They simply rammed their way between the boats to get to the wharf. We sailed (well actually we were only a fake sailboat) through the islands and it truly is spectacular. Our first stop was Hang Sung Sot cave (Amazing Cave), a cave with three giant chambres. It was quite Disneyesque as they had lit up the walls and packed walkways through the floor. It was probably the most impressive cave we’ve ever seen. Next, we moored in a bay and had the opportunity to swim and kayak. We kayaked through a shallow cave to a hidden large lagoon with sheer cliffs encasing it. how snobby). We were staying at a hotel on the island, which was jam packed with local tourists. Chaos, chaos, chaos! We skipped the scheduled trek and instead checked out the beach. In the afternoon, we visited Monkey Island, unfortunately the monkeys were MIA. The last day, we got back on the boat and “sailed” back to Halong City. Halong Bay is really beautiful, even though it was extremely busy being the Vietnamese holiday. We had booked train tickets to Sapa in advance, although all we could get was the hard sleeper. We weren’t sure exactly what that meant. Paul tried asking the lady if it meant hard, like “knock, knock”, on the desk. She replied yes and we knew we would be in for a long night. We took a taxi to the train station and noticed right away that the meter was going up at an astrinomical rate. Patti peeled the tape covering the distance on the meter, which had been tampered with. We promptly told him we wouldn’t pay that much and threatened the police. Gave him what we thought was reasonable, but frustrated by the incident. it was hard. 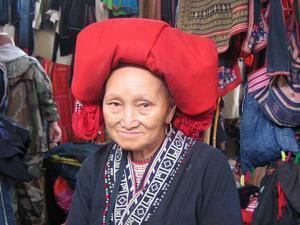 Sapa is located in the north, near the Chinese border. 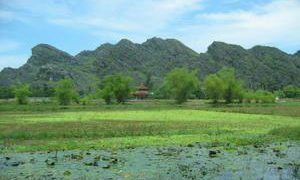 It is a town high up in the hills that is popular with tourists because of its close proximity to numerous hilltribes. We were also looking forward to a break from the sweltering heat in Hanoi. And of course we were still holding out hope of finding a peaceful place in Vietnam. We checked into a great hotel with beautiful views over the mountains and terraced fields. Unfortunately being the wet season, it rained and rained our first day. We wandered through the food markets and the hilltribe markets. The hilltribe ladies wear their traditional colourful clothing that are truly unique. 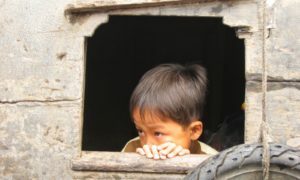 The people here seem really friendly and the hilltribe children love to engage you in conversation. One of the favourite games seems to be “guess eachother’s age” and I have been quite dismayed that they think I am 30! It is a lot cooler up here and we have been indulging in many hot drinks. Meeting up with Toronto friends, Brian & Sara for some bai hoi (homebrew beer) with the locals. and talking to some of the hilltribe women, who are from Hmong villages in the surrounding area. Enjoying lots of warm drinks and soup to keep us warm – what a change in weather! The tourism industry is not as developed in Vietnam, as Thailand and some other countries in SEA. They want your money, but they also ignore you for the most part as well. You can get great hotel rooms at cheap prices – A/C, hot showers, TV…we’re in heaven! At first we weren’t very impressed by the food and missed the heavenly food of Thailand. But we are starting to get better food, particularly the make-your-own springrolls. Vietnam shares close ties with China and their cuisine reflects this. Their idea of meat is a lot different from ours. They eat every part of an animal and it seems they think we do too. Family is very important in Vietnam and they eat their meals family style with many different dishes to share. On our Halong trip, we got served tons of tofu, squid and the likes. here, we weren’t very taken by the country. The scenery is beautiful, but we found the food not so great, the people not very friendly and it more challenging to organize travelling on your own. We’re seeing another side of Vietnam now and adapting to the country. We had numerous occasions where people tried to take advantage of us and after the friendly smiles in Thailand, it takes time to get used to a culture that seemed like the people weren’t very friendly. We want to put a disclaimer in here that perhaps this was merely our experience and may not reflect Vietnam, or Hanoi in general. However, there were numerous times when people would shortchange us, or we almost fell victim to scams, like the taxi one. When we asked people for directions, we would often be shooed away. We also found that people would simply push you out of their way. Cultural differences, that we judge based on our Western biases left us initially with a negative impression. We continue to keep an open mind and have found Sapa to be a welcome respite. we head south from there.